Ok, my name is Joshua a lot of people call me by my high school nickname of Detroit Navy, and you can call me whatever you want. I have come to this site to write some wrestling content. I am an old school guy and most of what I write here will be from the old school. Hopefully you like it, maybe you won’t, but hopefully we can get a good discussion going. I am going to start with my top ten favorite wrestlers. This is based on nothing more than the enjoyment I personally got out of each performer. I got this idea because I just bought the WWE DVD 50 greatest Super Stars of all time. I will start my top ten list at number ten with Scott Hall. 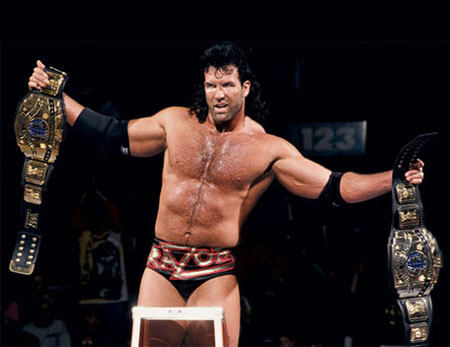 I always liked him as Razor Ramon and in that character I think he was involved in the greatest wrestling match I ever saw (of course I am referring to the Ladder Match at Wrestlemania 10) and he would go on to be a huge part of the most successful wrestling angle ever the nWo. Like a lot of great entertainers Scott’s career was marred by personal demons. However, even with that he remains one of my favorite talents to ever enter the ring. Unlike most fans who started watching WCW after he debuted there, I had been watching WCW on Saturday Nights on TBS for years. I can remember watching Scott as part of the Diamond Mine stable. He got a big push back then in like 1991, but like everything else in WCW it faded quickly. His run as Razor Ramon and later in the nWo was the stuff of legend. He may not have been the biggest guy, or the best wrestler but I always enjoyed his work, his matches, and his character. I always wondered how much of a role his feud with Goldust led to him leaving the old WWF in the first place. I have heard a lot of rumors over the years that he was not a big fan of that particular angle. In the end for me Scott Hall had a great career, even though since I don’t happen to like TNA I did not see his later stuff. Welcome to the site. Be nice to see some more old school posts going up.